The Santa Barbara Flyers are not currently hosting Dog Obedience classes. We hope to offer Dog Obedience training again soon. 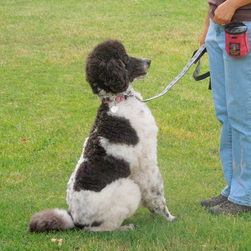 We do host weekly Obedience practice sessions for skilled dog/handler Obedience teams. Please check back later for an update on Obedience class offerings by the Santa Barbara Flyers. The Santa Barbara Flyers will host a USDAA sanctioned event, including Titling and Tournament classes, March 30 - 31, 2019 at River View Park in Buellton, California. The Santa Barbara Flyers will host a USDAA sanctioned event, including Titling and Tournament classes, August 17 - 18, 2019 at Camino Real Park in Ventura, California. Santa Barbara Flyers host USDAA Titling and Tournament events, and offer Agility practice sessions for all levels. Click here for more information about Dog Agility. Santa Barbara Flyers offer Obedience and Rally practice sessions for competition and basic obedience training. Click here for more information on dog Obedience and Rally. The Santa Barbara Flyers offer free Agility and Obedience practice sessions to our members, and to non-members for $5 per dog per session. Contact us for more information [Contact]. Our club is open to all well-mannered dogs and people.